Mark and I have been working with Southwest School of Art on a series of short documentaries following their faculty. Our first film is with ceramicist Ryan Takaba. 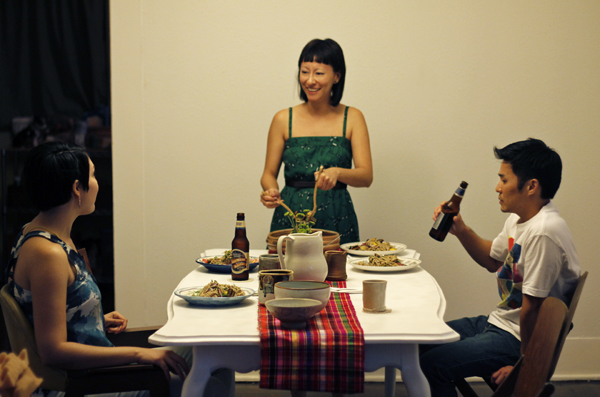 After we completed filming with Ryan last week he and his fiancée Jennifer Ling Datchuk invited us over for dinner. I love Jenn and Ryan’s cute little home, it makes me want to have our own home to decorate and make our own too! 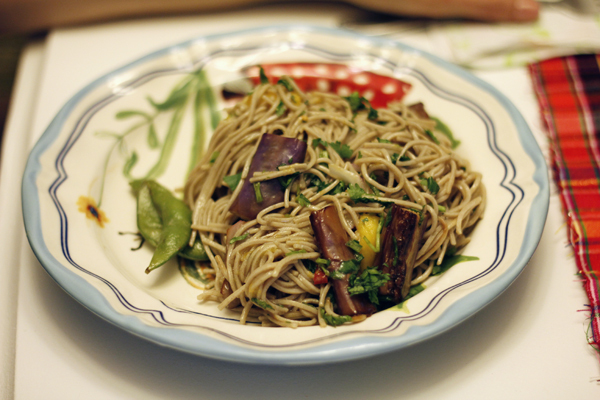 For dinner Jenn made Soba Noodles With Eggplant and Mango from Yotam Ottolenghi’s vegetarian cookbook Plenty. Soba is the Japanese name for buckwheat and is synonymous with a type of thin noodle. She also served Edamame, immature soybeans in the pod that are normally served whole. She added sesame oil and Chili flakes. 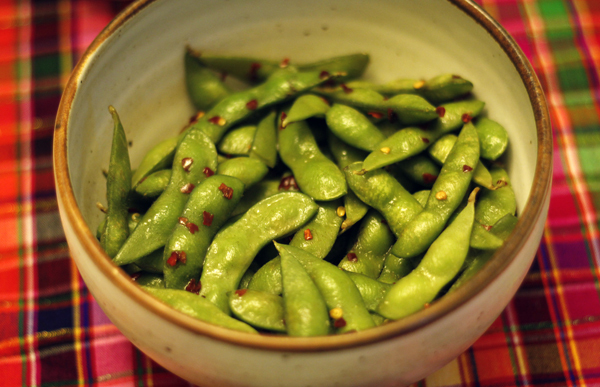 I love edamame, they are so fresh and have the perfect texture. I just have to learn to be patient getting the soybeans out or they go flying all over the table…which they did. As I’ve mentioned in a previous post, it’s crazy hot in San Antonio. This dish was perfect because it’s served chilled and has both the fresh fruit and vegetables I crave. Mango & Eggplant? Seriously delicious. 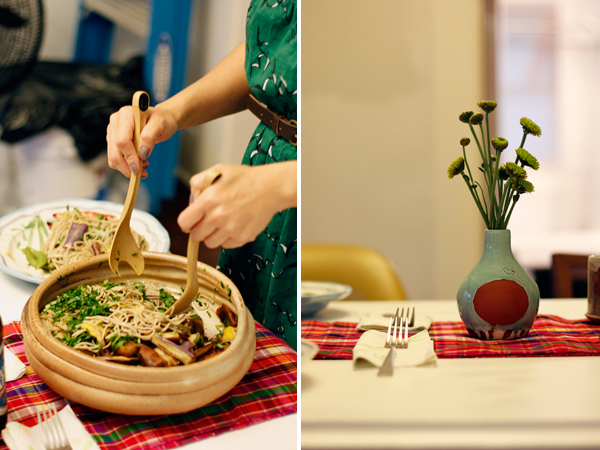 Jenn and Ryan have a great collection of handmade dinnerware, which is covered by tasty food above. Trust me, their dishes are awesome. They’ve inspired me to only buy handmade in the future. Jenn and Ryan also have the cutest dog in the world named Scooter. We like to call him Scoots. Scooter is so cute and friendly! The hubby and I are leaving for Hawaii in exactly 9 days and we we’ve been slowly planning our week-long trip. Mark’s brother Richard is getting married on O’ahu so we have some plans, but for the most part we’ll be on our own (!!!). We asked Ryan and Jenn to give us some suggestions for our trip since Ryan grew up there and Jenn has visited with him many times. We checked out a couple of books from the library and Ryan took some time marking off his recommendations. They also told us lots of great stories and gave us a lot to look forward to. We could not be more excited about the trip. Things have been crazy with all our projects lately so going to Hawaii is a welcomed vacation. 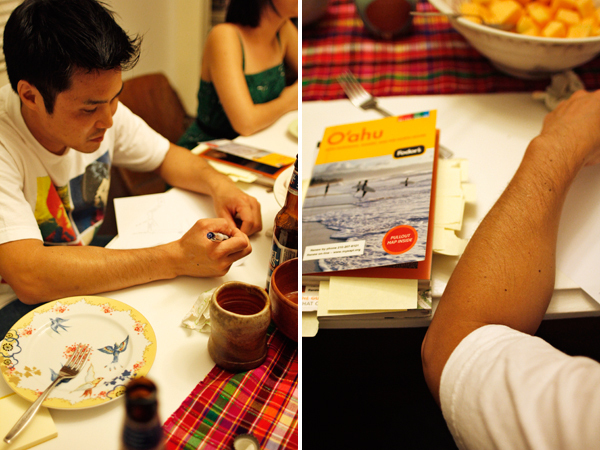 Thanks again to Jenn and Ryan for a delicious meal and all the travel advice! p.s. Watch the film Dylan: The First Three Years I mentioned in my previous post. This entry was posted in Dinner Party, Family + Friends, Savory Recipes. Bookmark the permalink. While on Oahu, be sure to take a drive down the H3 to the Windward side. I lived in Kaneohe for three years, and the view as you emerge from the tunnel on that side is spectacular. That view always signaled home to me. The Pali Hwy windward is beautiful as well. Enjoy your vacation! Thank you so much for the recommendation. We have some serious planning to do so we get to see as much as possible! I’m so jealous of your trip! I love Hawaii I can’t wait to read about it. That eggplant & mango dish sounds perfect. Over the weekend it was so hot I went to the store and bought fruit only! It’s your turn to be jealous, those dolphin photos you have are outrageous! Hope you like the dish! Yeah, it’s definitely fruit time in Texas. I look forward to sharing our trip, if I can get out of Jury Duty…but that’s another story. I LOVE Ottolenghi recipes, I’ve never had one fail! This looks fabulous. Have a great time in Hawaii! Thank you very much! Your blog is lovely by the way.